Does not happen to me. Have tried several times – both while recoring and not – it does not stop or shut down. HDW : Thanks for reporting back. Please be aware its an intermittent fault so you may come across this in the future. I have tried this many times and the camera does not shut down for me. It does go to the blank screen, wireless indicator is still on. Left for some time and a press of the disp button goes back to normal screen view. Will try again later today too but for now mine does not seem to have this problem. HDW : Hi Ron thanks for trying but please be aware its an intermittent fault so you may come across this in the future. It keeps switching off because it’s not a “real” camera. 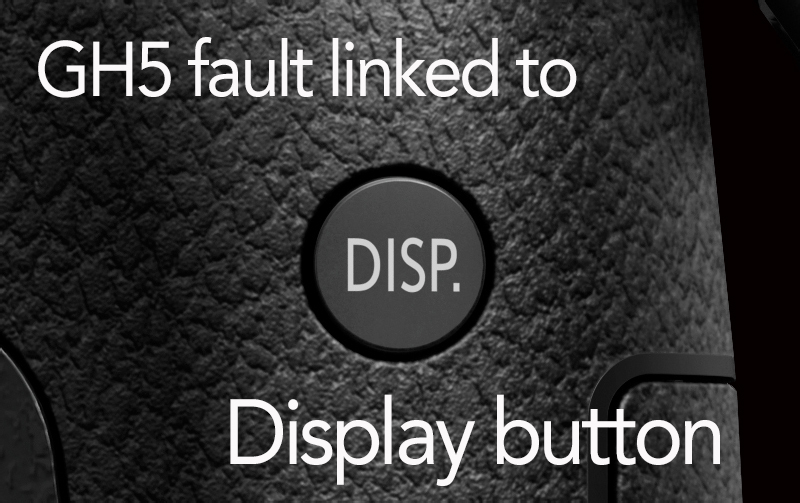 But seriously – until a bug fix arrives why not use the new “disable display button” feature. Works for me. Tried to recreate the problem but cant. Seems ok so far…. will watch with interest…..
My friend has the same problem. Even when he restarts, the camera shuts down immediatly. We could save the problem temporarely by quickly changing the display site while restarting. It seems, that the one specific grey Display Page without picture just showing sound-levels and other parameters forces the camera to shut down. Never happend to me after flashing fw 2.0. Also not set the DISP button. You can try a factory reset from menu. HDW : Just confirming I am on a Mac. Win 7 x64 here, no problems. Used my GH5 today after firmware update. Playback does not work and camera shuts down after 2-3 seconds. Camera will work on video modes but not on camera modes. If I hadn’t seen this post it was heading back to Panasonic for warranty repair. I am using Mac and based in UK. Updated the firmware today and it has created the same issue as you describe. Thought it was a power problem. Thanks for your post and work around lets hope there is a patch soon. Same here. When disp button shows info screen then after 2 seconds camera shuts down. Power on and again within some seconds shuts down. I have the same problem, when toggle the dipaybutton the camera shuts down in display info screen. then comes alive again when i press the shutter button. i am living in Sweden. My new camera firmware 2.0 Also shuts down after a few second. Same happens to me, noticed this morning trying to get to the info screen, the camera shuts down after a couple of seconds. Only remedy i found was to switch camera off (its already off) using the power button, switch back on and immediately change the display with DISP button. This happens in all modes. Contacted Panasonic, downloaded V2.1 update, issue fixed. Happened to me today. Used Mac to download firmware update. I’m in the US. Yep – same problem – really irritating -Panasoninc sort it out. Same proglem with my GH5 after firmware V2 applied, pressing the DISP until I see the large black and white info screen (the one with the large FStop, shutter, etc..) the camera powers down. Very frustrating Panny! Downloaded the Panasonic ver 2.1 update for the GH5 and the problem is now fixed. I have had the V2 software since shortly after its release, but only within the last couple weeks have I had the shut down issue. (I did take a small break from using my camera) so maybe it was always there and I just didn’t notice . But either way, I have the same issue. Power on, touch the display button and it will shut down. If I power on and off, it shuts down after a brief period. I’m in Portugal. If you can help, I’d be forever grateful.